Post Saltex, (which saw over 16,000 visitors and 444 exhibitors covering approx 48,705 sq metres of show ground), head groundsman Russell Knight had 18 days to prepare Windsor Race Course for it?s next flat meeting. Having arrived as assistant groundsman in 1965, for a proposed six-month stay, Knight was promoted to his present position a year and a half later, and has experienced every Saltex on the site since. ?The main problems are always the road ways and the four crossings linking the exhibition areas,? he says. ?A week after the show I walk round the entire site with the IOG?s health and safety representative and we inspect each stand space. Once an exhibiter has cleared his/her stand they either get a pass or not. If there?s any damage ? ploughed up areas which have not been re-instated or holes in the ground dug for flagpoles for example ? 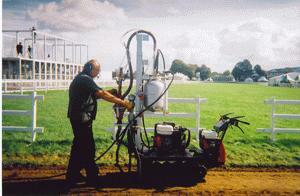 the IOG contractors are called in and the exhibiter is charged accordingly. There are generally patches of not-so-green grass, but we can renovate them during the winter, and because we?ve had dry weather for the last few shows, site damage, apart from the crossings, has been minimal.? One of the two top crossings on the far side of the showground is covered with fibre sand, and, according to Russell Knight, withstands the main lorry traffic well. Crossings serving the car parks are covered with aluminium sheets for a week, but the lower crossings, traversing the grassed racetrack are another story. Aluminium sheets cover these areas for two weeks, and after exhibitor?s heavy vehicles have used them, they take the majority of visitor traffic during the show. ?We lift the aluminium sheets the morning after the show closes and Terrain Aeration come in with their Airforce Terralift machines to perform decompaction treatment on all the crossing areas,? explains Knight. ?I then scarify with an Opico harrow to take any dead grass out and generally lift the flattened sward and fluff it up. I?ll then cut it - not too short, but just enough to lift it - over seed, give it a drop of fertiliser and cover it.? Russell and his team construct what they call ?mini greenhouses? by placing birch branches on the ground in a criss cross pattern and covering the area with plastic. This year, renovation of the crossings was on schedule. De-compaction and harrowing of all areas had been completed by the Friday evening (10th Sept) after the show and the re-seeding contractors were booked for the following morning. But at some point during the next 12 hours disaster struck. Russell arrived on site the following morning to find that after a light rain, heavy exhibitor?s vehicles had travelled over the treated crossings instead of taking the longer roadway exits as required. The previous day?s work was null and void, and the seed contractors had to be sent home and re-booked for the following Monday morning. ?Because of the position of the marquees I couldn?t lock two of the gates, and they just forced their way through,? remembers Knight. ?Who ever it was must have left early because I was on site by 7.45am and by then the damage had been done.? Luckily Terrain Aeration had stayed at Windsor and the company was able to re-treat the crossings there and then. ?The day before we?d used Airforce G, our ride-on terralift machine, inserting the probe one metre below the surface and injecting compressed air along with dried milled seaweed, at two metre spacings as usual,? recalls Terrain?s MD David Green. ?But on Saturday, due to the deep tyre marks disrupting the surface we decided to employ Airforce Tracker, launched at Saltex, and only one third of the weight of Airforce G. The fact that Tracker is mounted on a Honda Barrow also safeguarded the surface which was now muddy following the overnight rain, and we inserted the probe and injected compressed air at both � metre and one metre depths in an effort to provide as much aeration as possible.? By Tuesday 13th Sept Russell Knight, despite losing valuable time, felt that the racetrack would be ready for the meeting in two week?s time. 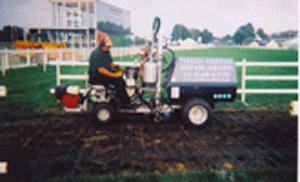 ?I was amazed that after the aeration treatment the areas were not too panned out and the scarification worked,? he remembers. ?In this situation you?ve just got to bite the bullet and get on. I was confident about all the crossings except one, and knew that if we got plenty of sunshine and showers between then and 27th Sept., they would recover in time. I knew it would be tight, but I was just glad it wasn?t worse. ?